One of my favorite things about summer is the smell of peppermint—from the fields, after a cutting; from the tubs full of fresh-chopped mint, as they’re trucked by our place on the way to the distillery; and even from the pummy (the word comes from pomace), when it’s steaming in a heap in my garden a year after harvest. The peppermint grown commercially in the Willamette Valley nearly all gets distilled into oil, for toothpaste, chewing gum, and candy. 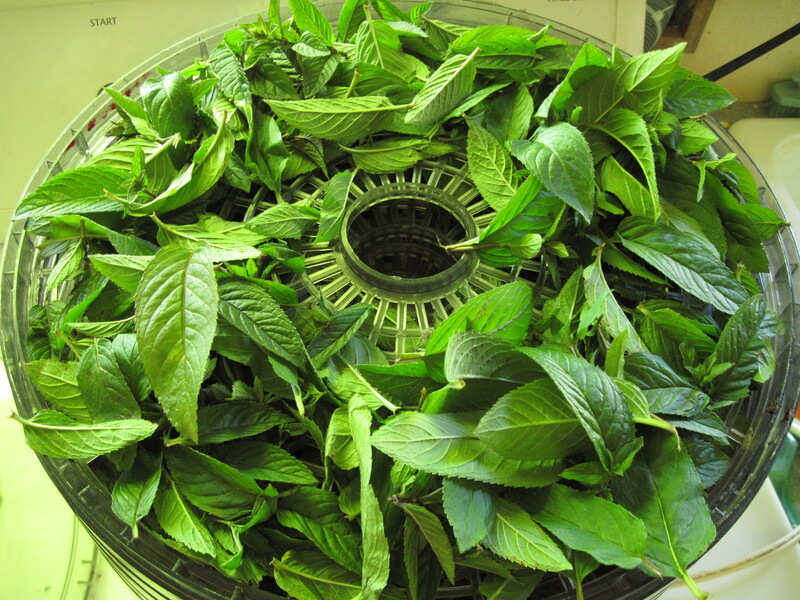 After the mint is cut and chopped in the field, it’s blown into enormous enclosed tubs that each become part of a still. One hose is attached at the base of the tub to inject steam, and another is attached to the top of the tub to collect the oily steam and feed it into a condenser. In a separator can, the oil rises to the top of the water. The steamed mint “hay” then gets dumped in piles, where it fragrantly rots into what must be one of the world’s best combined soil conditioner– fertilizers (provided the mint hasn’t been sprayed with a long-lasting herbicide like Stinger). 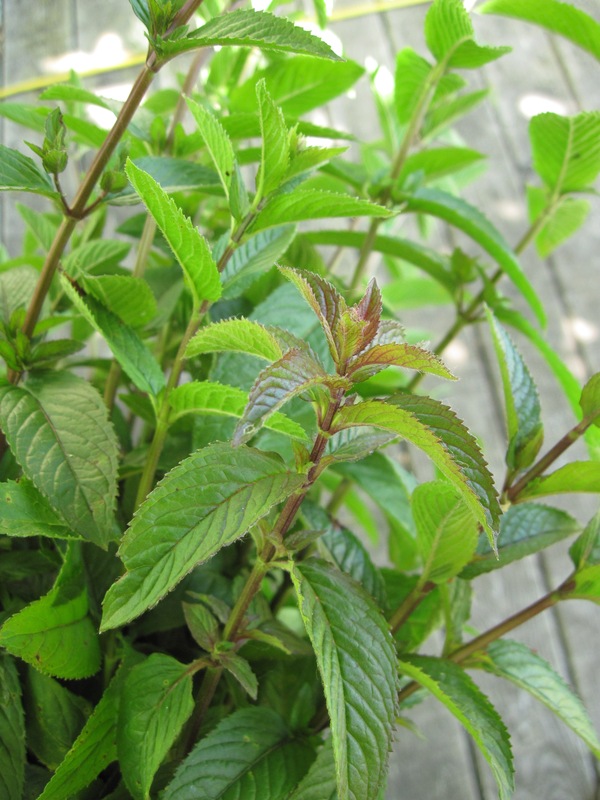 If you want peppermint for tea or any other purpose, your local mint farmer might not be prepared to accommodate you. My children, when they were little, addressed this problem by ripping a peppermint stolon from a neighbor’s field and burying it in our front garden. This is actually the way mint is normally propagated; seedlings are too variable. In the front garden the mint has spread a little over the years, but not much, because I give this thirsty herb scant summer water. In this way I’ve managed to ensure enough peppermint for an occasional cup of tea without the whole garden’s turning into a peppermint patch. A good time to dry peppermint is just before it flowers, especially if this happens to be when you’re feeling guilty for running a half-empty electric food dryer. Last week my North Star cherries were nearly dry when I thought to add a few trays of peppermint to the dehydrator. Some people prefer to dry their herbs in bunches hung from the ceiling. My daughter, actually, has a bunch of lavender hanging from the kitchen light fixture right now. For most herbs, this technique tends to work well only in places like California or the Southwest. Here in western Oregon, the weather is seldom hot and dry enough to dry herbs well—that is, so they keep their color and flavor. When I try to dry herbs in bunches, I usually end up throwing them out because they’ve turned musty. Drying herbs in the dehydrator is less trouble, anyway. For the peppermint, I shake or brush off any spiders, and then I tear off and discard the old, tough leaves at the base of the stalks. I run each stalk between my thumb and forefinger to remove the rest of the leaves, which I spread thickly on the dryer trays. I set these trays over any drying fruit, which needs a bit more heat. Then I enjoy the fragrance of peppermint for the next hour and a half, by which time the leaves are thoroughly dry. I crush the leaves as much as needed to fit them into a tea can, and I stow the can away in the cupboard. Stored this way, peppermint keeps its flavor and aroma for years, if we don’t use it all in the coming winter, as we probably will. I look forward to those chilly, dark nights when I’ll again breathe in the powerful scent of peppermint, in the steam from a hot mug. If you have no peppermint growing close to home, you might order the variety “Corvallis” from Nichols Garden Nursery. This entry was posted in Herbs and tagged food; herbs; herb tea; mint; peppermint. Bookmark the permalink. Peppermint makes the most refreshing iced tea for a hot summer day, especially here in hot, sunny Georgia. I used to make and sell it (and several other iced teas) in college to support our Environmental Club. People couldn’t get enough of it. The peppermint was always the first to sell out. That sounds like an excellent idea for a summer fundraiser.